Massachusetts Dermatology Associates offers its patients on the North Shore MA sclerotherapy with Asclera® (polidocanol) which is administered by Dr. Deborah Cummins, board-certified dermatologist. Those seeking removal of small, red/purple spider veins or reticular veins located on thighs and lower legs. What visible results can be seen after sclerotherapy? 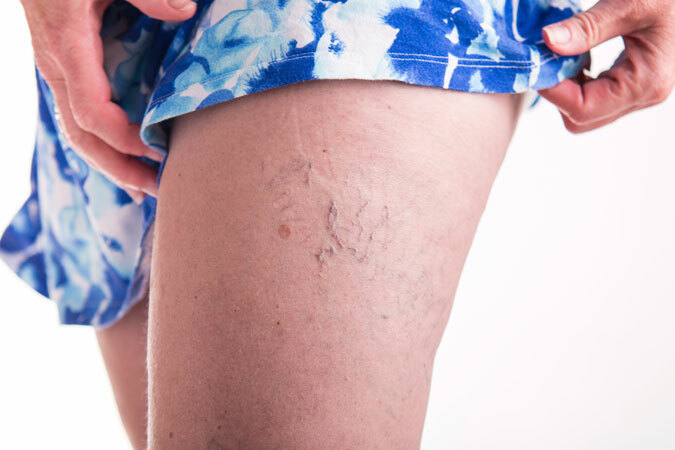 Immediately after the procedure it often appears as though the treated veins have not yet disappeared. It takes 2-4 weeks for the vessels to collapse and for maximal effect to be visualized. Who should not get sclerotherapy? Those with a history of blood clots, congenital heart defects such as patent foramen ovale, poor wound healing, or diabetes should avoid this procedure. Sclerotherapy should also be avoided in pregnancy and patients who are nursing. Injection of a sclerosing agent (polidocanol) into small blood vessels promotes their collapse, fibrosis, and disappearance. While most patients tolerate the procedure very well, there is often mild pain associated with the injections, bruising after the injections, a small chance of ulcer formation, scabs, crusts, hyperpigmentation, hypo/depigmentation at injection sites, and very rarely the formation of blood clots, CNS/visual disturbances, thrombophlebitis, scars, or allergic response. Usually, if these occur, they are temporary and can resolve in a few days, weeks or months but may be permanent. Described below are complete instructions regarding after care of the treated area. Improper care of the treated area may increase the chance of scarring or skin textural changes. How many sessions will I need, and how long will the effects last? Often four to six sessions (spaced 6-8 weeks apart) is sufficient to result in significant improvement that lasts at least one year. I just got a tan two weeks ago. Can I get sclerotherapy today? We would advise against it. Unprotected sun exposure in the four weeks preceding sclerotherapy significantly increases the risk of pigmentary side effects (formation of light or dark spots). Likewise, unprotected sun exposure during the month after sclerotherapy can have the same consequences. How shall I prepare for the procedure? Wear comfortable clothing and purchase compression stockings at a local pharmacy (knee length for lower leg treatment and thigh high for thigh treatment). Bring compression stockings to the appointment in order to wear them immediately afterwards. Be prepared not to exercise (other than brisk walking) for 3 days after the procedure. Do not put moisturizer or any other skin cream on legs on the day of the procedure. The doctor will cleanse the affected leg areas with alcohol and proceed to inject a sclerosing agent (Asclera®) into the vessels in question using a very small needle. There will be multiple injections and some minor discomfort during the injection procedure, but it is tolerable and local anesthesia is not indicated. A typical sclerotherapy session lasts 15 to 45 minutes. How shall I care for my skin after sclerotherapy? You will be advised to put on compression hose after the procedure and walk for 15-20 minutes around the Cummings Center to minimize the chance of a blood clot and for us to be immediately available in case of allergic/anaphylactic reaction. You will also be given explicit instructions to wear these compression hose for 48 hours straight and then just during daytime hours (not at night) for the following two weeks. Doing this compression will provide the best cosmetic results and decrease the chance of hyperpigmentation (dark blotches) or blood clots. You will also be instructed to avoid exercise (other than brisk walking) for 3 days after the procedure. Avoid jacuzzis, hot baths, and saunas for 1 week. We also advise avoiding long travel. If you have to travel, make sure to wear your stockings and walk periodically.